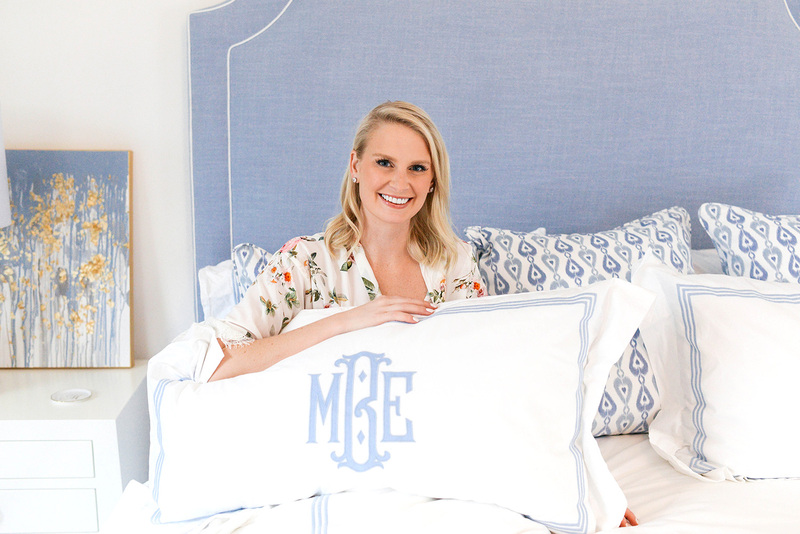 I still have quite a bit of work to do on my master bedroom (I still need to find a rug, a mirror, etc), but I’m so thrilled I can finally share photos of my beautiful bed linens from Matouk! I was waiting on those printed Euro shams to complete the look… while doing custom fabrics is fun and opens up more possibilities, it can take quite awhile to get it all pulled together and finished. With that said, let me introduce you to my Matouk bedding! Since I already had my headboard fabric picked out, I was looking for either a complimentary or matching look with the trim on my duvet, pillows and sheets. Luckily, Matouk has a bunch of amazing shades for each of their bedding collections, so I had a lot to choose from! They were kind enough to mail me samples, which made the selection process much easier. I’m definitely a “clean lines” girl, so the Bel Tempo style spoke to me – it’s one of their classic looks, and is a style I know I’ll still love years from now. If you’re looking for something truly custom to your space and super special, definitely check out their Bespoke Embroidery selection – the designs are exquisite! What I really struggled with, however, was deciding on a monogram style. There are SO many gorgeous options (you can see them all here! ), and it was tricky to even narrow it down to my top five. I’d already seen the above monogram (#2064) on the website and liked it, but wasn’t yet convinced. I decided to take a peek at their Instagram account, and looked at both their published photos and customers who had tagged them in photos to get some inspiration. 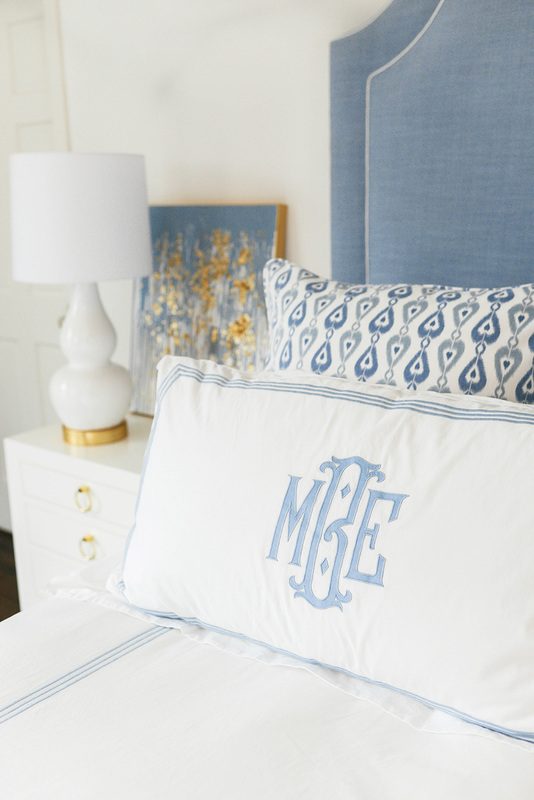 I then came across a photo by a customer who had ordered pillows with this monogram, but they had requested a thicker font than the one you see on the website… I LOVED IT! My choice was made. 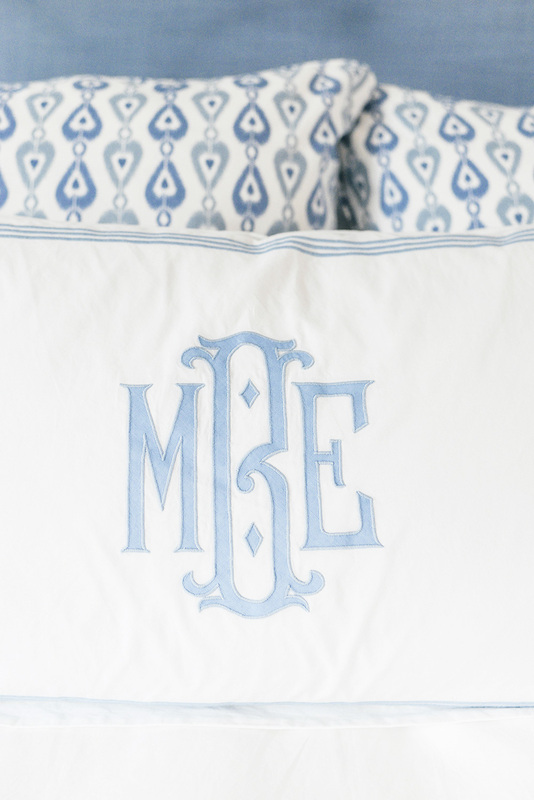 I decided to use this monogram on my two King shams on my bed, and also in my bathroom on all of my towels – you’ll see those soon! 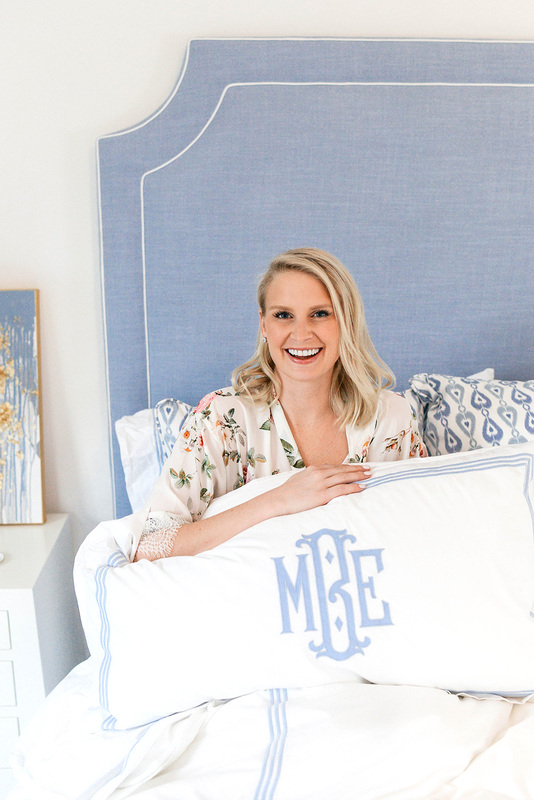 I’ve now been living in my Matouk bedding for a few months and have been absolutely loving them! They are of the highest quality and are so comfortable, not to mention they look amazing. 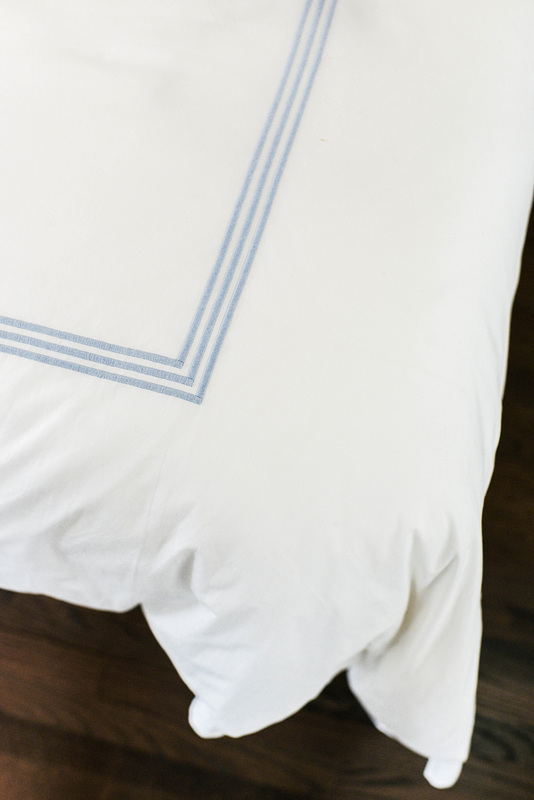 I highly recommend investing in Matouk’s beautiful bed linens for your own home. You spend half of your life asleep, so you might as well get the bedding of your dreams! Your bedroom is beautiful!! You have the best taste. It has been really fun following you along your new home journey. Curious if you used the same bedding as the purple room at your Mom’s house? I remember you mentioned the bedding being amazing in that room. My bed could use an upgrade. so sorry to bother…but where are your nightstands from? thanks so much!!! I’ve actually already linked them here! If you scroll to the bottom of the blog post and look just below the text, you’ll see a “Shop the Post” section with links to everything featured here! Where is your bed from? Custom? If yes do you remember the fabric? 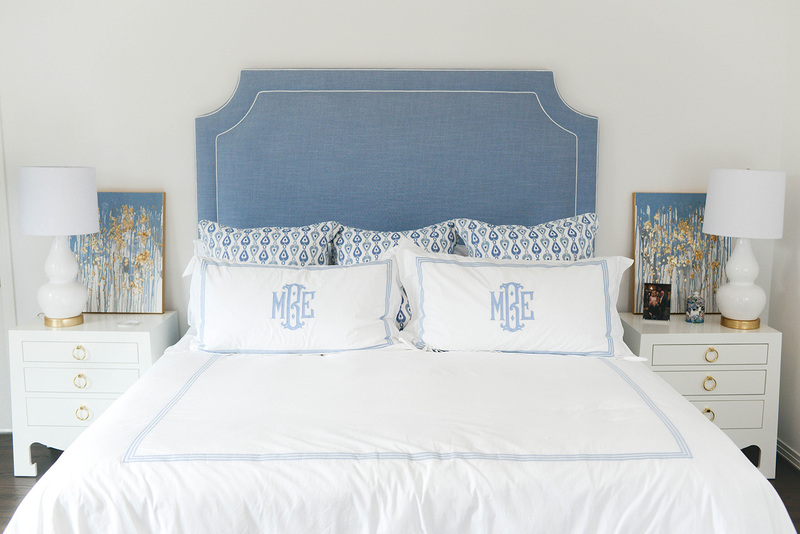 Yes, the headboard is custom! I used Jane Churchill’s Adler Fabric in Pale Blue! Beautiful stuff! Where did you get the actual headboard and the Ikat euro shams? Thanks! All of these details are in the SHOP THE POST section at the bottom of the page! Also love the art! Where did you find that? All so clean and crisp! And finally any thoughts on a good white paint? What are tiny using here? Just started following you!